As followers of my London blog will know, I’ve currently been in the process of moving flat. It’s been a fairly lengthy effort and it’s well-documented on the other blog. What this entry will cover is the mind-numbing frustration the websites of estate agents caused me over the last two months. Flathunting in London is even more painful than in other cities – the market moves ridiculously quickly (even for renting) and estate agent websites are notoriously out-of-date. Call up for a viewing of a flat and it turns out it was let weeks ago – but still listed on the site. But that’s the last of your frustrations. Almost all of the sites I encountered made browsing painful. Other sites like RightMove and Globrix exist to ease this pain, but their problem is frequency of updates – often they’ll take a day or two to pick up changes on the estate agents’ site, which, as we know, is probably a week or more out of date itself. All of this adds up to produce misery. Here is an illustrated guide to some of the more frequent frustrations I’ve felt over the past few months of browsing property websites. 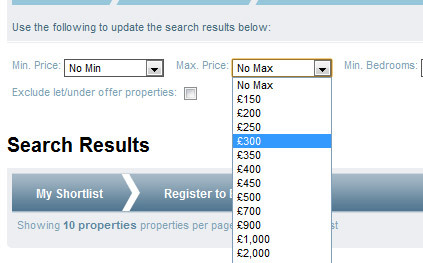 A surprisingly large amount of sites make the fairly basic error of not specifying the price range on the property search form. Most sites list rentals in both weekly and monthly denominations, but James Pendleton here decided that the user didn’t need to know what they’d be paying. The cynic in me suggests that this is deliberate, so you erroneously end up browsing stuff over your price range, but that’s silly. A frustratingly frequent problem, some sites didn’t offer any way to exclude “let agreed” properties from the search. Some of them featured results listings where literally every house was let. While this is perhaps symptomatic of the London rental market, the fact remains that this decision is for the benefit of the estate agent and to the detriment of the customer. If Oliver Burn‘s search above returned fewer properties there might be a risk they’d appear sparse and unpopular, so instead they spam you with tantalising “here’s what you could have had” displays. This one boggled my mind. If you’re selling a property and the user can’t physically see it, then you are completely reliant on imagery of the house to sell it. Why make it difficult to see the images? In the example above on Aspire‘s site, there were actually six photos – these were only revealed when you click the plain-looking “photo slideshow” link to the left. Figure 4: hey, who needs a search form anyway? 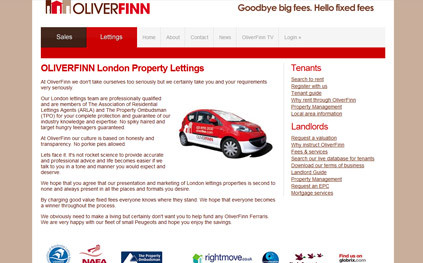 Two enormous menu buttons on Oliver Finn‘s site: “Sales” and “Lettings”. Click either one, however, and you end up on what looks suspiciously like an SEO-enhanced landing page with no search form to filter the lettings. If you even stick around long enough to click the ‘Search to rent’ link, you’ll get a form where you still can’t filter by price or bedrooms. Fail. This one was profoundly irritating. 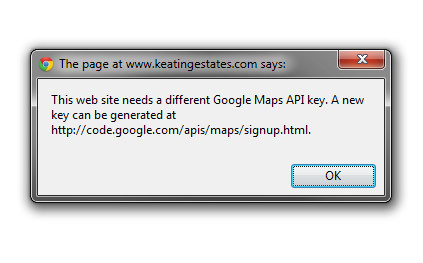 For one, the newest version of the Google Maps API doesn’t even require a key any more. This was quite an obnoxious decision on Google’s part too, to use the alert() function to tell the user the key wasn’t valid, but I digress. The error in question only manifested itself when visiting Keating Estates via a third party service like RightMove, rather than using the site directly, oddly. Also, from the landing page where this error appeared, there was no way to click through to the property page itself, instead only showing you a broken Google map. No rental for me, thanks. Figure 6: we don’t need no stinkin’ copy! 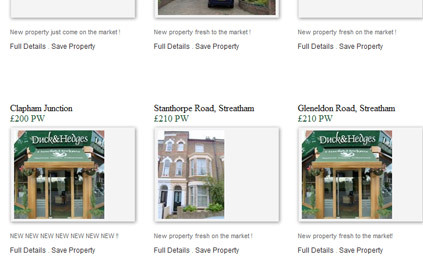 Hopefully the size of this screenshot won’t make the text too hard to read, but essentially, every property on Duck & Hedges‘ search result consisted solely of text like “New property fresh on the market!”. If this was true you’d believe they refreshed their entire property portfolio every day. 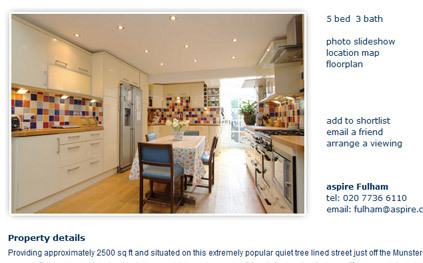 Text is a great opportunity to sell (especially when filler images of, er, the agents’ offices, are the only photos on display) so it seems odd to misuse it. Above all, clever agents use terms like “modern detached flat” to describe what actually turns out to be a tower block (technically, I guess it’s true). Don’t be generic. This site (incidentally, my old estate agent’s Atkinson McLeod) featured a large amount of search results, but chose not to bother displaying the pagination links underneath the results (you know, where you end up when you scroll down through a list), instead opting to place them at the top of the page (you know, right when you’ve just started to look at a long list of stuff). Come on guys. The first few times I used their search I didn’t even realise there was a second page of results. I wonder how many clickthroughs this loses them every single day. The tragedy here is that there are a number of sites aiming to solve all of these issues – Globrix has a fantastic search, super-customisable and very intelligent. It organises images into clearly-visible galleries, lets you filter very powerfully, paginates like a dream (even via ajax) and always uses Google Maps (not the godforsaken Bing ones some sites are besmirched with). 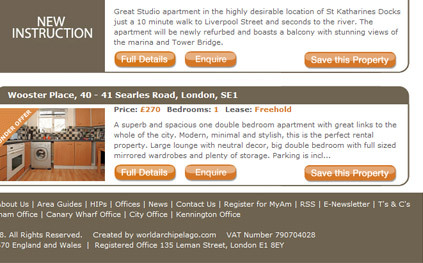 It also has a great mobile site, something a few of the other property sites I used actually had too. This was great. Sadly, as noted above, it lags behind the sites themselves so disappointment is often the result of calling up about a property found there. 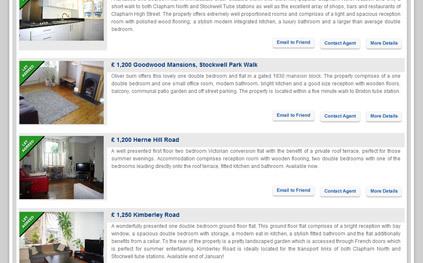 I don’t have any smart ideas about how to solve the usability nightmare of estate agent websites – they’re too concerned with flogging overpriced box rooms in Camden Town to bother sorting it out. But perhaps smart third parties can find ways to become even smarter, and eventually we can just do all our searches through them. Good hunting.